Thank you to everyone who signed up for being a greeter at rehearsals. This week’s greeter is Al Huneke. 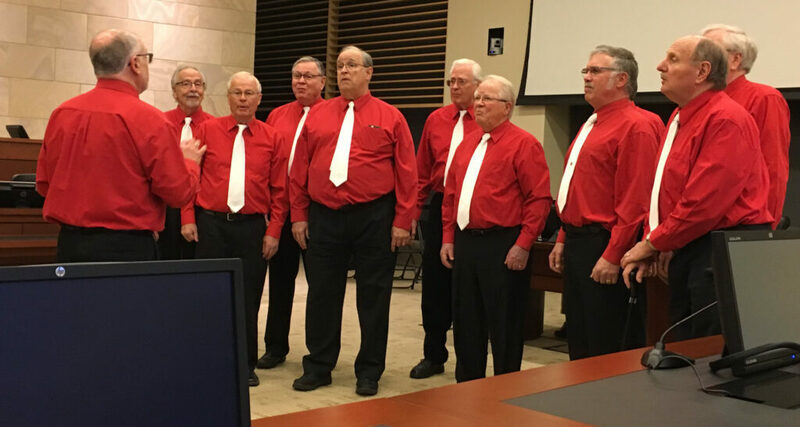 Cal Birkey directs Aged2Perfection in their performance at last Friday’s New Citizen’s Ceremony at the Federal Courthouse. Singing were tenors Ray Smith and Garth Beatty, bass Gary Lindsay, lead Gary Glockoff, bass Larry Aspleaf, lead John Roltgen, and baritones Bob Handley, Al Huneke and Tom Zuber. A2P has sung at each monthly ceremony so far this year. 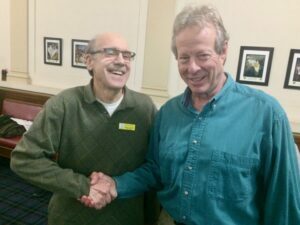 Wendell Aldrich congratulates Doug Horton on his renewal last Thursday. 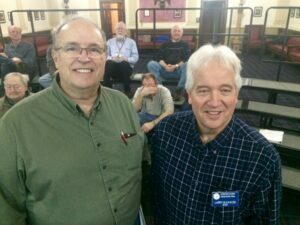 Doug has been a member of the chapter and BHS for four years, and been a member of County Corridor and Timeless quartets. Also recognized for his renewal last week was Gary Glockoff. Gary has been a member of the chapter and the BHS for 37 years. He has sung lead for the Profound Sound quartet for 11 years, served as chapter president, and has two Men of Note. Thank you for all you have done for the chorus, Gary.